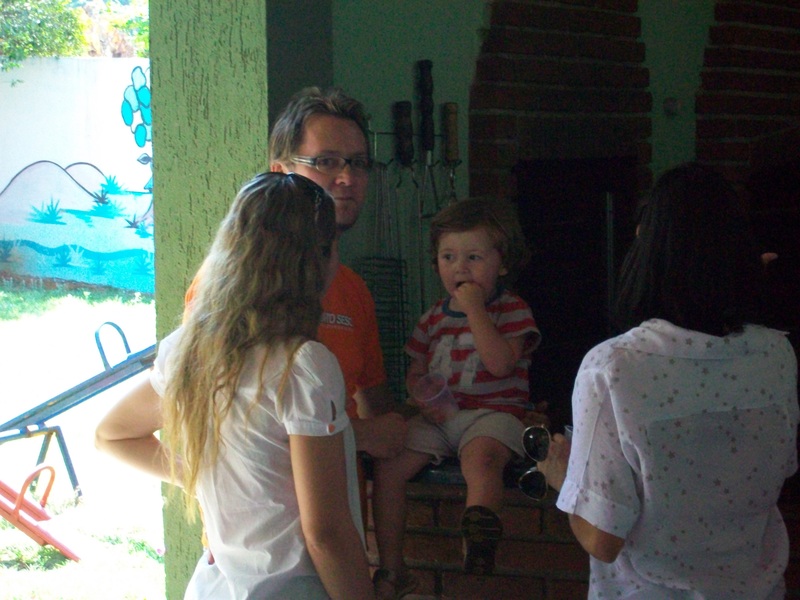 My Brazilian “nephew” and his parents. Our luggage (okay, the luggage that belonged to the ladies – Adam and I were fortunate enough to have our luggage from day one of our time in Londrina) arrived bright and early on Sunday morning, so that was a great sense of relief. Last night we went to a Brazilian hamburger restaurant and ate entirely too much. I was playing with Pastor Paulo’s son David (he is 2 years old) last night at the restaurant by swinging him around in my arms like I do my nephew. He would laugh hysterically and when we were about to leave, he said something to me in Portuguese but I couldn’t understand him. I asked Pastor Paulo what David said and he replied “David said to you, ‘Goodbye my American Uncle! '” and that just made my heart melt! This morning Saulo (the Singles Pastor) took us on walk around the lake and brought his dog Mona Lisa along with us. After another wonderful meal we met with the Singles environment volunteers and during our meeting we shared some American candy with them. Tomorrow evening we will be doing an event for the singles in the area and we can’t wait. We are having a great time in Londrina! The food is amazing, but we have been going constantly without much rest. It’s getting late, so we need to hit the sack. Londrina – It’s Been Amazing! We’re Here! 6 Americans Invade Londrina.